On the Pasadena Heritage 1940 Forward Modern Home Tour (you can see all six homes here), I had the pleasure of visiting an early Buff and Hensman home, built in 1954 for an oil company executive. Again, like the Tyler House, this home is a well crafted tribute to the post and beam construction prevalent in the mid-century. This charming little home sits down into an arroyo and is nearly atop of a running stream which appears to wrap itself around the home. The home is so tucked in you barely even notice it among the tree tops. The Norton House, 1954 designed by Buff and Hensman. Listed on the National Register of Historic Places. Gracefully set amongst the natural arroyo, the post-and-beam construction is an excellent example of the mid-century modern era. The interior is accented by an open floor plan, wood ceiling, cork flooring and walls of glass to further the indoor - outdoor California living style. A graceful stream flows on the property, and under the bridge, and together with mature landscaping provides soothing vistas and the most tranquil location for this architecturally significant home. The Norton Home reflects the spirit of mid-century modernism. In every single post from the Pasadena Heritage Tour I am going to mention the photo situation. Someone did not verify her camera settings during the tour. I have tried to make up for blurry pictures with artistic filter affects and scintillating copy. The pumpkin trim and orange door remind me of Dana's front door. Interior living space. Dining table and a glimpse into the seating area with plank ceiling, beams and interior skylight. Love the built-in sofa and the carryover of the pumpkin. Dig that concrete block fireplace and interior divider wall! Honestly, the coolest houses bravely use concrete and I always love it. Zillow says this home last sold in 2011 for $1.3M. Honestly, someone got a bargain. Close up of the fireplace. Can you see the mosaic inlay tile? I never even noticed it on the tour. Charming credenza with a piece of art pottery. See the cork floors underneath? So comfortable to walk on and very fifties. The kitchen table is set right into the concrete block. Super clever. Asian influences abound in this home. I appreciated that the home was staged so nicely with plants and flowers. As a veteran of home tours, I never really know what I am going to walk into. You would be surprised at how little people can prepare for hundreds of people to traipse through their home..
Another view of the indoor/outdoor concrete block. I like when the architects take an element from the exterior and pull it into the interior. It is always a nice surprise. The kitchen was undergoing renovations. Half sort of looks the way it will be and half is the way it was. I think it is heading in a nice direction. Here is the original parts of the kitchen, I think. The mosaic inset is original and is being preserved. Do you love it? So mod, so cool and carries the pops of orange. Lucky homeowners. Master bedroom. The bed is built on a platform. Very Asian influenced. And a soaking tub! Very Japanese. I don't know if the tile is original or the tub is original. It seems to be in exactly the right place in the bathroom so I kind of think it is. View from the bathtub (okay, yes I got in it). Architects Conrad Buff III and Donald Hensman were both graduates of the University of Southern California, establishing their partnership in 1948 when they were both students. 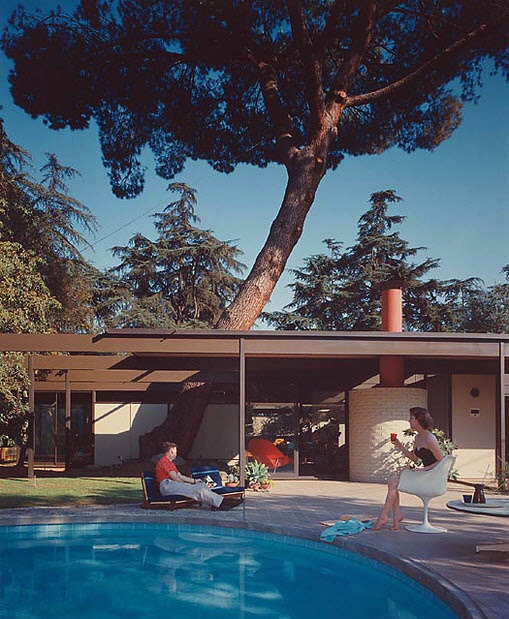 Perhaps their most famous claim to fame was Case Study House #20. Charming outdoor dining room. The lower level of the home (potentially basement area), had been refinished into a nice home office/bedroom and bathroom. The feel of this home evoked the Liljestrand House, but on a much smaller scale. Loved the tile trim. Just enough, not too much. And back out I go. Over the bridge. Great bridge with intricate lattice work railing. And, the requisite mail box. You can see more pictures at Take Sunset, from 2011 when the home was staged to sell. Really stunning interiors; the listing pictures are quite good with some angles I couldn't have gotten. 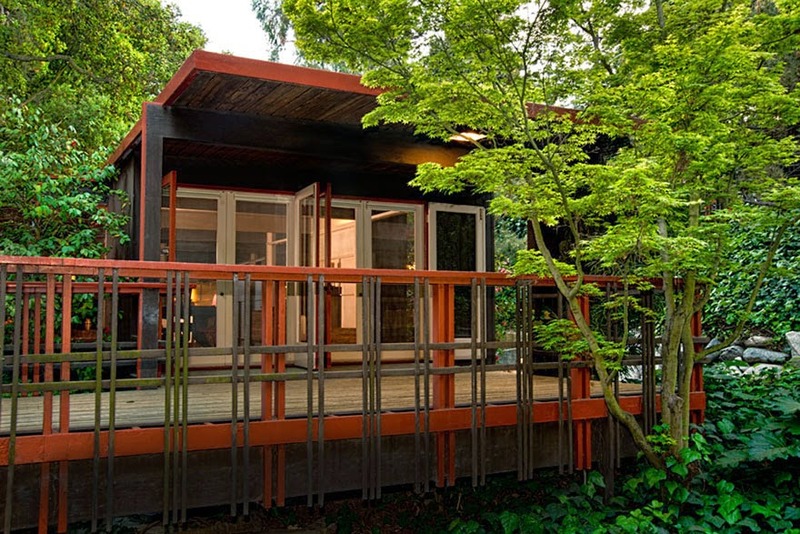 Another excellent example of mid-century modern architecture with just a touch of craftsman. More to come early next week. Enjoy your Memorial Day and here comes summer! Pasadena Modern Tour 2013: Dorland House, 1950, Lloyd Wright, Architect. Thank you! Enjoyed the read. You are so welcome! Thanks for the drive-by. Another gorgeous home! Naturally, I loved the orange door and trim. (Thanks for the mention, by the way.) That decorative tile work in the kitchen is amazing, and I agree that the built in table is genius. I am so tempted to go orange on our door as we have a brown house. But I do have the green weakness as well. Big decision. Love all the orange touches (as I sit here in an orange tee). That sofa is beyond cool, and the setting, tucked into the arroyo--beyond beautiful. I do love orange. It was the setting that I couldn't get over. It was impossible to capture the charm of this home being built into an arroyo with a wraparound stream gurgling by. So charming and peaceful. VERY zen. I liked the railings working with the house's lines in pic #2, but like you, the fireplace - "the coolest houses bravely use concrete..." Yes! Perfect, right to the thin bottom layer on its overhang. I can only imagine spending time enjoying the arroyo setting it's set into, as well. $1.3 million for that home, inside touches, and that site is not bad for the LA area...even here! Hello David! I know the price may seem shocking but honestly in the LA area for a renown architect, it is really not crazy. The setting was very peaceful. Another amazing house. Love the colour of the front door (Dana clearly has good taste!). The plank ceilings really add warmth to the house. The fireplace is gorgeous and like you, I love the built in couch with orange. The kitchen table wrapping around the concrete is very clever. Dana does have good taste! Now if she would only reveal already. Lovely to see what is happening on "the other side" - it shows that you love the architecture and, as you said, have been on more than one tour. Here in South Florida (where i work) we had a different set of architects making their name - Rudolph, Nims, Parker, Polevitski etc. - so I love the different perspective. Many thanks for a fine post! Yes, this is not my first rodeo for sure. A little addicted to architecture. Different names, but the same aesthetic. I'll take a peek at your blog to see. I be Florida carries more of that tropical influence.